Take A Closer Look At Labor Force Participation. Is It Really As Good As It Looks? The headline takeaway from the October employment report was the robust gain of 250,000 payroll jobs. The unemployment rate edged up fractionally from 3.68 in September to 3.74 in October, but commentators dismissed that as insignificant. Instead, they pointed out that the unemployment rate failed to fall because of a flood of new workers into the labor market. That influx produced a welcome rise in the labor force participation rate, from 62.7 percent to 62.9 percent. Still, that monthly uptick was not enough to break labor force participation out of the stagnation that has prevailed since late 2015. As the following chart shows, the participation rate has wobbled up and down over that period without showing any trend at all. What is going on here? Isn't the stagnation of labor force participation just a sign of the aging of the U.S. population? Yes, at least in part. The next chart shows labor force participation for prime-age workers only, aged 25 to 54. that rate has turned up sharply since hitting a low of 80.6 percent in September 2015. 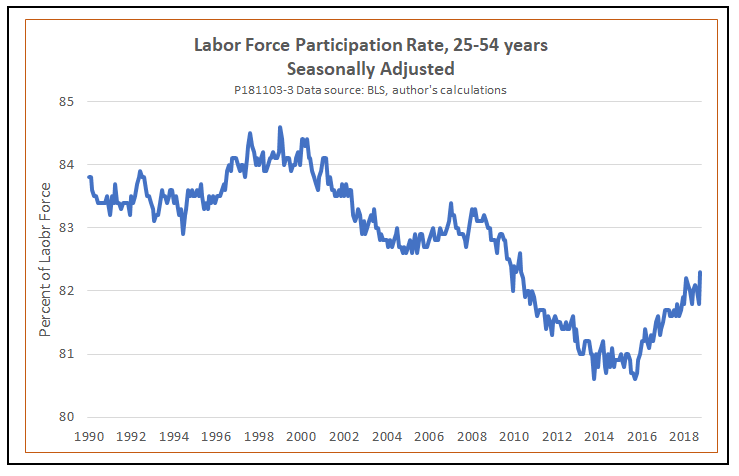 The flat trend of the overall participation rate simply means that an increase in the average age of the civilian labor force, which includes retirees, has offset higher participation by people in the working age population. However, there is one more variable to consider. The economy has been expanding steadily for nearly 10 years, ever since the Great Recession bottomed out in mid-2009. From then until 2015, though, the participation rate continued to trend downward even for prime-aged workers, despite the increased availability of jobs. We should be asking whether or not the current tightening of the labor market has been pulling workers back into the labor force faster, or more slowly, than we would expect, based on past experience. 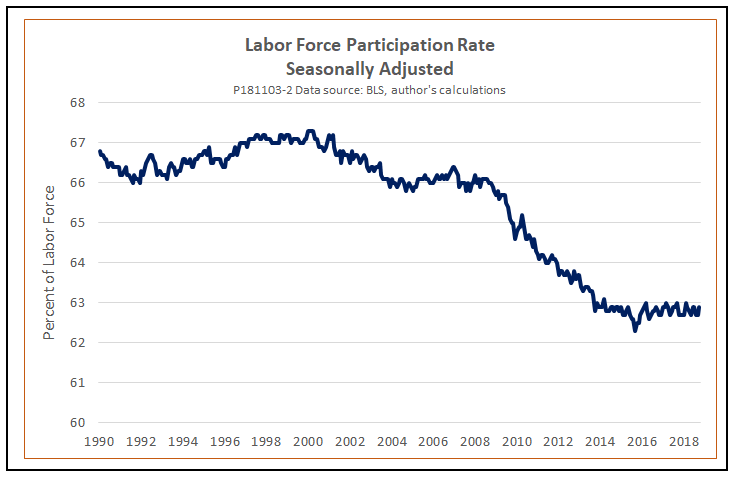 To answer that question, we need to look at the behavior of the cyclically adjusted labor force participation rate. The cyclically adjusted rate tells us what the rate should be in any year given that year's unemployment rate. 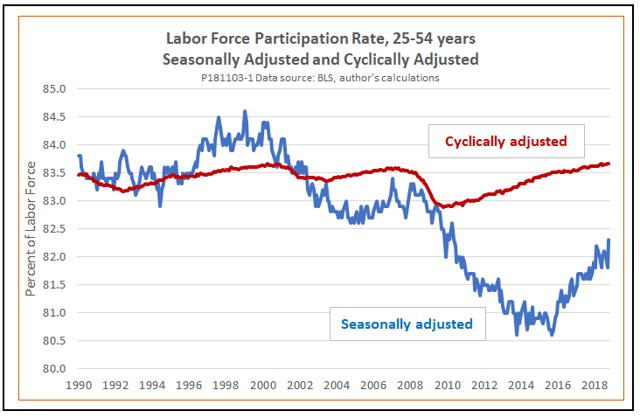 The next figure shows actual and cyclically adjusted participation rates for prime-aged workers. Cyclical adjustments are made on the basis of the relationship between the unemployment rate and labor force participation that prevailed from 1990 to 2007, the last year of the previous expansion. What we see is that based on past experience, the participation rate should have begun expanding much sooner after the trough of the recession than was actually the case. If it had, the participation rate would have been almost 2 percentage points higher now than it is. Even in this chart, there is a bright spot, if we want to find one. Since hitting its low point, prime-age labor force participation has been catching up with the cyclically adjusted trend. If this pattern continues, and if no new recession strikes, we may be back to cyclically adjusted norms in a couple more years. In short: Recent gains in labor force participation are all to the good, but the glass, which was nearing empty three years ago, is still only half-full.